I bet you are a fan of unicorns and that is why you have clicked this post. Have you ever thought of getting your own unicorn chrome polish? 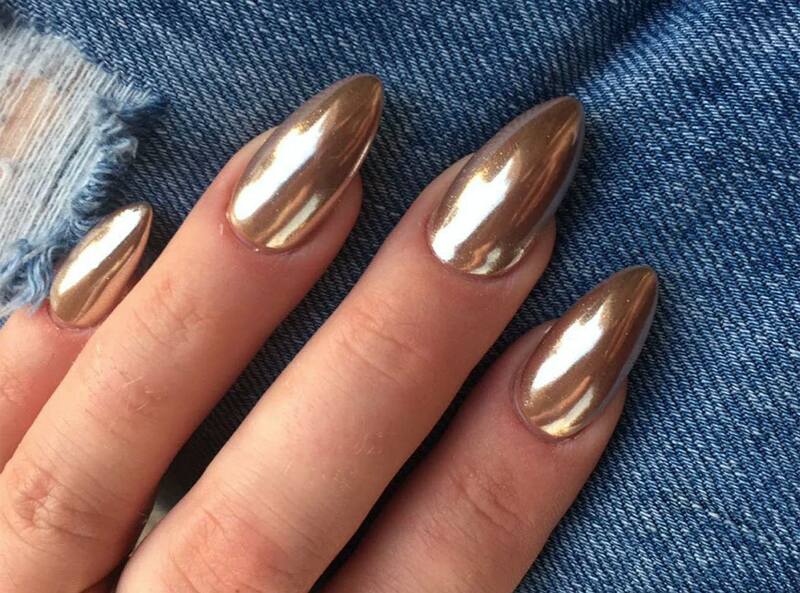 Have you ever thought of getting the same chrome polish just like Hollywood stars? I am Nikki from KIYOSA Japanese Total Beauty and I am here to share some facts you need to know. The trend for chrome polish started when Gigi Hadid walked the red carpet at Met Gala. Gigi Hadid’s manicure for that evening costs $2000, shared by her nail artist Mary Soul, which made her the most-talked about celebrity of the evening due to her killer silver chrome nails. Social media sites such as Instagram, Youtube, Tumblr, and Pinterest are now overflowing with nail video tutorials and photos of this new chrome polish trend. This has been trending worldwide because of the mirror like finish it gives, which has a different finish from a regular polish. Chrome polish, also known as Mirror nails, will give you the illusion of shiny, mirror like nails from a fairy godmother. It will make your nails glossy, lustrous, and reflect light sources around it, which can also create an enchanting rainbow effect on it. “The chrome effect will vary based on the base color it is applied over. Darker colors, such as black will give a more visible chrome look and the level of chrome shine can be determined by the tool and technique in which the chrome powder is applied with,” said Kanika Ashford, an educator at LeChat Nails. Creating a chrome polish is very similar to gel polish wherein you would need a base coat, a gel polish, and a non-wipe top coat. You would just need to add an extra step, which is the chrome powder and some curing for it to look perfect. A touch of this special loose chrome powder can make your nails look glamorous and have a high-shine finish like you have never had before. Chrome powder is made out of glass, metal, and pigment. The reflective effect of the powder comes from the metal, which is silver, that is actually in between the base polish and the clear polish on top. The chrome powder should be finely milled for it to fill in very well. 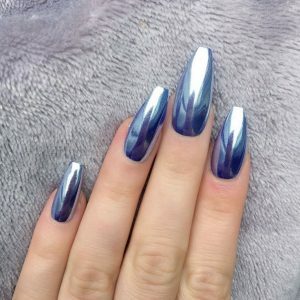 Different looks and effects can be done with different pigments wherein the base color can be any shade of gel polish and it can be topped off with any shade of chrome powder such as Aurora, Silver, Gold, Galaxy, and Unicorn. Gel polish is used as the base color for chrome polish because this will make your polish last longer without chipping and peeling off for weeks. Gel polish will last longer than a regular polish and will dry up in just one to two minutes. Once your gel polish has dried up, there will be no risk of smudging and chipping anymore. Moreover, this will help prevent the breakage of your nails. The only cons for having gel polish is that it is more costly and has a UV factor included in the process. Gel polish is more costly since this will require a different kind of polish that will help the polish stay longer on your nails for as long as three to four weeks. At the same time, this gel polish needs to be dried using a UV lamp. If you are planning to have gel polish, make sure to apply sunblock on your hands before going to your nail salon to avoid the harmful rays of the UV light. First Step: Application of Primer and Base Coat. It is important to apply primer and base coat before anything else. The main purpose of the primer is to help the polish adhere to your nails and to prevent it from lifting. As for the base coat, this will help your manicure last longer and prevent the polish from staining your nails. Second Step: Application of KIYOSA Gel. KIYOSA Gel is your gel nail color that will last for three to four weeks long. You may choose any color as this will be the base of your chrome polish. Third Step: Dry the KIYOSA Gel using UV Light. In order to dry your gel polish, a UV light will be used for one to two minutes for the gel polish to completely dry and prevent any chipping and peeling to happen. Fourth Step: Application of Non-Wipe Top Coat. A non-wipe top coat will be applied over the gel polish so that it will not affect the gel polish after wiping. A non-wipe top coat is primarily used for mirror effect polish and for other gel polish. Fifth Step: Application of Chrome Powder. Here comes the most exciting part! After your non-wipe top coat has dried, you may already apply your choice of chrome powder by buffing it against your nails with a tiny sponge-tip applicator. Your nails will automatically become shiny and glossy right after application! Final Step: Finish it off with Top Coat and Cuticle Oil. Seal your chrome polish with a top coat so that it will not chip, it will last longer, and at the same time, it can add more shine! The last and final step would be the application of cuticle oil in order to moisturize your nails and cuticles. Cuticle oil can help stimulate nail growth because it contains vegetable oils, vitamins, and citric acid. At the same time, it can help improve the appearance of your nails and make it look healthy. Chrome polish is recommended to be done by a professional or a nail technician since there are some factors in each step that may lead to nail damage and peeling. Some of the factors may include how much chrome powder should be buffed against your nails, how long the UV lamp should be used, and how to know if your nails are completely dry already without touching it. “If you under-cure the polish and you don’t give it enough UV light, then the polish won’t firm up enough. It is theoretically possible that if you spend a little more time under the light, you will get more bang for your buck in terms of durability,” said Randy Schueller, a cosmetic chemist. Moreover, if you would be designing your nails with stones and add some nail extensions, this should be properly done by a professional or a nail technician in order to avoid mistakes since this step could be very tricky. At the same time, nail technicians can offer some ideas if you have a particular design that you are interested in. 1. Do not forget to apply base coat and sunblock before starting the whole process. 2. Make sure your gel polish is tacky enough before placing the chrome powder on top so that it will adhere to your nails. 3. Always use a tiny sponge-tip applicator to be able to go through all the edges. 4. Pat the chrome powder before buffing it against your nail and dust off all the excess powder afterwards. Remember to only use a little! Do not go overboard with the chrome powder as this can become very thick and peel off eventually. 5. Always secure and seal with a top coat. 1. It is very trendy right now. 2. It has a shiny, lustrous, mirror-like finish. 3. It has various colors to choose from such as Aurora, Silver, Gold, Galaxy, and Unicorn. 4. It is made out of glass, metal, and pigment. 5. It can last up to three to four weeks. 6. It takes at least 1.5 hours for the whole process. 7. Stones can be added on top of chrome polish. 8. The color may fade and lighten. 9. It can help prevent nail biting and breakage of nails. 10. It is more costly compared to a regular polish wherein the starting price is at Php 1380. Never pick and peel off your gel polish when it is already chipping. Always use acetone for your gel polish removal since picking your gel polish can lead to removing the top layer of your nail bed, which can weaken your nails. Women love perfect nails and that is why they choose gel polish instead of the regular polish since it will last longer without chipping. However, it is also important to give your nails a break once in a while because this can lead to making the nail brittle and prone to breakage, which all women do not wish to happen. All kinds of polish should be removed by acetone and not by picking it and waiting for all of it to chip and fall off. In order to have a good polish, it is important to take care of the nails. If the nails are brittle and broken, no matter how expensive the polish is, it will not look nice and will just look damaged. One way to take care and improve the health of the nails is to avoid eating junk foods. There are three main reasons why nail biling should not be done. Firstly, it can damage the tissue around the nails and it will grow into abnormal-looking nails. Secondly, this can affect, chip, and break the teeth and can also lead to jaw problems in the future. Lastly, our hands and nails are full of germs from all the things that we touch. Nail biting will let germs inside our body and eventually lead to sickness. 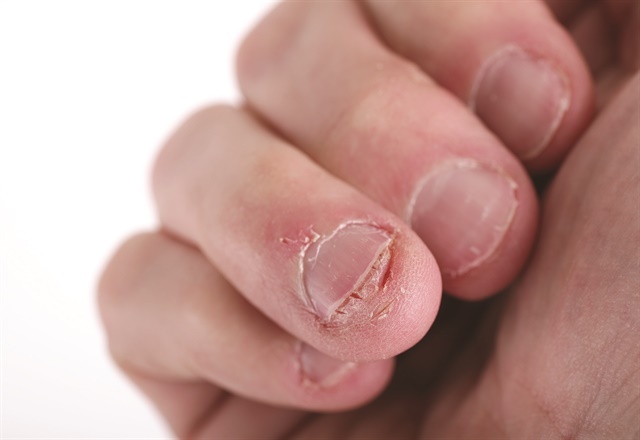 In order to prevent nail biting, nails could be cut short, coat the nails with something spicy, or wear gloves. Here are some celebrities who loves Chrome Polish! Here are some Chrome Nail Arts you can try at KIYOSA Japanese Total Beauty Salon in Manila! Which shade of chrome powder are you excited to try? KIYOSA Japanese Total Beauty is offering chrome polish services in both our branches in F1 Hotel, BGC and S Maison Conrad Manila. We will be glad to assist you in your next nail adventure!